The Bowerhill Primary School classroom day runs from 8:50 a.m. until 3:15 p.m. However, the school curriculum covers everything that the child experiences during his or her time at school and includes activities beyond the classroom. Our early years foundation stage (EYFS) classes may well be your child’s first experience of sustained contact with adults and children outside your close family and circle of friends. We hope to make the transition from home to school a positive and happy experience for children and their parents. We want children to go home bursting with stories of their exciting day at school. Children joining our early years foundation stage classes find themselves in an exciting learning environment. They are taught in well-equipped, modern classrooms and use a covered, all-weather area and hard-surfaced area for outdoor learning. They also have their own separate field and safe all-weather surface for their playtimes. Each child will know their own teacher and teaching assistant. However, the two early years classes are open plan, with activities arranged across both rooms and the shared outdoor area. During the course of the day, children may work alongside children and adults from the other class. Children are encouraged to make choices and decisions in their learning and develop a sense of independence in preparation for work in the coming years. The adults they meet at school will be enthusiastic, well-trained people who enjoy the activities almost as much as the children! Our provision for these children is validated each year against the Bristol Standard for Early Years, a quality assurance scheme. Visit the website at www.bristolstandard-cyps.org.u... for more details. The basic classroom curriculum for all schools is comprised of two main elements: The national curriculum and religious education (agreed locally). Breadth — It should introduce children to a wide range of knowledge, skills, and understanding. Balance — Each subject of the curriculum should have sufficient time to make its special contribution. Relevance — Subjects should be taught so as to draw on, and show applications to, the child’s own life experience. Personalisation — What we teach, and how it is taught, must be planned to extend each child’s mastery of skills and knowledge. At Bowerhill Primary School we have worked with education consultants Focus Education to introduce the ‘Learning Challenge Curriculum’. This is not a list of specific topics to cover or knowledge to impart as the areas of study and skills to be taught are provided by the National Curriculum. It is a way of organising a series of lessons which captures the interests of the children and makes the learning relevant to them, whilst meeting the National Curriculum requirements. 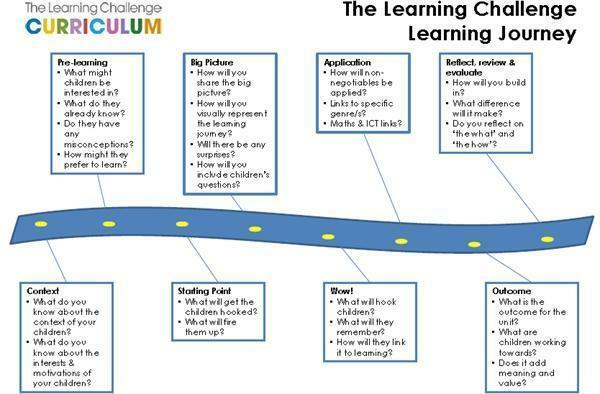 The Learning Challenge Curriculum requires teachers to actively think what their curriculum needs to include in order to meet the needs of the children at this school – leading to high standards in all areas of the curriculum. The approach allows teachers to focus on the best way to present their lessons rather than what they need to teach. At Bowerhill School we have used a topic-based approach to the curriculum for many years. This involves linking some subject areas through a common topic or project designed to ensure the children are interested in purposeful learning. The Learning Challenge Curriculum is a natural development and improvement of this work. This document below called 'The Learning Journey' shows how teachers plan a class topic. Alongside the class topic planning, the teachers will also focus on basic skills in the core subjects of Maths, English and Science. In 2014 Bowerhill School introduced Read Write Inc as a scheme through which to teach basic skills in reading and writing which will then be used across all subjects in the years to come. Read Write Inc focusses on a very structured approach to teaching reading through phonics in EYFS and Year 1. Click here for more information about the Read,Write Inc scheme. Click on the links below to see our year by year expectations for reading and writing from September 2014. The link below shows our year by year expectations in the other subjects of the National Curriculum. We offer lots of first-hand experience from Early Years classes right through to Year 6, with visits and visitors supporting work across the curriculum in all year groups. We usually expect Our children have residential visits in Years 5 and 6. When school trips are planned it is usual for us to invite contributions towards the cost from the parents of pupils involved. However, it is our policy not to exclude children from taking part in such excursions when contributions are not forthcoming due to financial hardship. Parents unable to make a contribution should discuss the matter in confidence with the teacher organising the visit or with the Headteacher. In addition to the main curriculum, there are activities organised as a valuable extension to the school day. Many of our staff give their time at lunchtime or after school to offer a range of activities which are free of charge. Activities change from term to term depending upon what members of staff are able to offer. A typical range of activities would include netball, football, cookery, rugby, choir, ICT and art. Although our children have weekly music lessons, they are also offered the chance to learn a musical instrument. These lessons are organised by the school but are paid for by parents. Children can learn the guitar, woodwind instruments, piano or drums. Some extra-curricular activities are offered by outside organisations. For example, Judo lessons and Tae-Kwando are taught in our school hall in the evening.